Why 78, 45 and 33 1/3 record formats? The first disc format was the 10-inch 78 rpm record, pictured above in the center, invented around 1900. The first record player was invented around 1870 by Thomas Edison, but this used cylindrical records about the size of an empty toilet paper tube. The flat 78s were much easier to store. The grooves on these records were much larger than later LPs and 45s (about 4 times as big) and the needles were larger too. 78s were recorded and played back "acoustically", without any electric amplifiers or microphones, until about 1925. 78s were obsolete by about 1960. Since the grooves are so spaced out and the records spin so fast, a standard 10-inch 78 can't hold more than about 3 minutes of music per side. They are typically made of a shellac compound (as in furniture finish! ), and have the consistency of a china plate, so they are very thick and heavy and break easily. The 33, a.k.a. 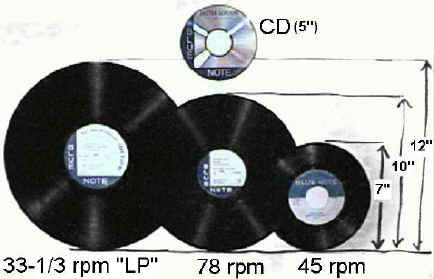 the "LP" (Long Playing record) or "album", pictured above at left, was invented in 1948. These LPs were popular until around 1990 when CDs were popular enough to take over. An LP could hold up to a total of 60 minutes of music, but most didn't have more than 40 minutes. They are made of vinyl plastic rather than shellac, so they are more flexible and don't tend to break like 78s. The grooves are 4 times smaller, so they were originally called "Microgrooves" (MG), and early LPs have this written on the label. Interestingly enough, there are enough people still willing to buy "classic" albums, particularly jazz and blues, that some of the labels in those styles, like Blue Note records, Original Jazz Classics (a.k.a. Prestige, Riverside, Contemporary, New Jazz, etc) and Delmark Records are once again pressing and selling LPs for about $9 - 13 through mail order. LPs of some newer releases are available, in very limited quantities. The 45, pictured above at right, was the alternative to the LP when you wanted to record a single pop song rather than a full album. The 45 had the same smaller-sized groove as the LP, and the center hole was larger. 45s became popular in jukeboxes, which had previously used 78s, because 45s took up less space and you could fit more songs in the box. Suddenly jukes went from offering 24 or 40 songs on 78s to having 100 to 200 songs on 45s. 45s are also made of vinyl rather than shellac, and can hold up to about 5 minutes of music on each side. 45s are still being made in limited quantities for jukebox operators who have not upgraded to newer CD jukeboxes, so you can still get some of the latest releases on 45.
speed of old-fashioned gramophone records, rather than a round number such as 75 or 80 rpm? And are there convincing explanations for the choice of speeds for later EPs and LPs of 33 1/3 rpm and 45 rpm? It was Emil Berliner, the inventor of the gramophone, who determined roughly how fast old disc records should spin. He avoided Edison's need for a stylus made from precious jewels by using points which could be made from steel sewing needles and pins. The size of the stylus effectively determined the size of the grooves in a record and the recordable frequency range limited by this groove size determined a speed between 70 and 90 rpm. Standardization did not begin until 1912, when the British Gramophone Company conducted listening tests on their back catalogue. They settled on the average (or possibly the median) of these tests, which turned out to be 78 rpm. Other companies adopted this, but the process was not complete until the early 1930s. Even after this date Òrogue rpmÓ records still appeared. After standardization problems still occurred. Because of electrical mains frequencies differences on opposite sides of the Atlantic, stroboscopic speed testers and synchronous motors meant a nominal speed of 77.922 rpm in countries that used 50 hertz and 78.261 in countries that used 60 hertz. These were later fixed in national (but not international) standards. Records of 33 1/3 rpm were developed in conjunction with films. A 12-inch 78 with Berliner-type grooves could hold between 4 and 5 minutes per side. The first practical sound films produced in the US in the late 1920s had their sound on separate disc records and it was more important for the sound to be continuous. A reel of film might run for 11 minutes, so a rotational speed of about 32 rpm was required to make the sound match the picture. History doesn't tell us why precisely 33 1/3 was chosen, but in retrospect it was a very good choice because stroboscopic speed testers can be made for this speed which will work on both sides of the Atlantic. It seems CBS engineers (who developed the first LPs in 1948), simply experimented with one of the old machines hanging around in their workshop. They then developed new groove dimensions which gave an acceptable signal-to-noise ratio with the new plastic material "vinyl". The 45 rpm speed was the only one to be decided by a precise optimization procedure (by RCA Victor in 1948). Calculus was used to show that the optimum use of a disc record of constant rotational speed occurs when the innermost recorded diameter is half the outermost recorded diameter. That's why a 7-inch single has a label 3 1/2 inches in diameter. Given the CBS vinyl groove dimensions and certain assumptions about the bandwidth and tolerable distortion, a speed of 45 rpm comes out of the formula. From 1894 to around 1930 there were many different record speeds ranging from 65 to 90 rpm, each case being a compromise between playing time and the need for a clean cut in the original wax. The Victor company used 76 rpm for many years for its recordings but instructed buyers to reproduce at 78Ñthe recordÕs durability was improved that way. The standard of 78 rpm arrived by default, although the actual speed depended on the electrical mains frequency. Constant linear speed, or varying the rpm, was commercialized but did not prove to be a success (until the arrival of the CD). been suggested that 78 minus 33 equals 45 was the reason for the emergence of 45 rpm records but, in fact, Maxfield's analysis still applies: the 45 "single" was RCAÕs equivalent to a 10-inch, 78 rpm record, only smaller. Emil Berliner's first disc gramophones were wound by hand at somewhere between 60 and 100 rpm. The 7-inch discs lasted a minute or so and had low sound quality. Berliner and his assistant Fred Gaisberg realized that unless the speed was governed, the gramophone would never be more than a novelty. Gaisberg visited a young mechanic who was making clockwork machinery in hoping to use it for sewing machines. This machinery was never successful in sewing machines, but was ideal for gramophones, and it rotated at 78 rpm. The mechanic, Eldridge Johnson, became a millionaire. Columbia made all its discs to run at 80 and HMV had its pioneer recordings produced between 68 and 92 rpm with the key of the piece marked on the label. You then tuned it on your own piano, using the gramophone's governor. These speeds all gradually settled into the standard of 78. When talking pictures first arrived in the late 1920s, the sound was recorded separated on discs and had to be synchronized by the projectionist at each showing. Every cinema projection room had a pair of projectors, each taking 1000-feet reels of film, whose running time was about 10 minutes. The projectionist switched projectors after each reel. Ideally, this meant that the sound should last 10 minutes as well, as it would be impossible to synchronize a sound changeover in mid-reel. At the time, however, a 12 inch 78 rpm record lasted for only about 4 minutes, so the Vitagraph company simply slowed down the 78 until it lasted 10 minutes and recorded all their masters on that, starting each disc in the middle, as it was easier to drop a needle there than the outer edge. This new speed was 33 1/3 rpm, adopted for other records in the late 1940s when Columbia introduced its first vinyl, long-play discs with microgrooves, giving a play time of about 30 minutes on each side. However, the long-play disc wasn't particularly suitable to popular music, as the public wanted its records as singles with good sound quality even at high volumes. RCA Victor came up with a 7-inch vinyl disc with microgrooves, rotating at 45 rpm, a speed chosen specifically to make the most of the music, unlike 78s or 33 1/3s. And does no one remember the 16s?